During my time working for the IT department at CCCU I have overseen a complete overhaul of the department’s communications. Audited all IT department output and compiled an extensive summary report along with recommendations. Created communications (comms) plan for the department, along with specific plans for projects such as Office 2016, Core Network Upgrade and e-Connect. Established and documented processes for content creation and review. Created an IT communications calendar including all key dates and milestones. Sourced and arranged the order of 8,500 USB sticks for new students 2016/17. Created an IT Communications Officer handbook for my replacement to maintain communications consistency through the transition. Published over half a dozen ‘IT Updates’ in the University’s email newsletter, InTouch. Carried out a complete review of the IT department website, and associated digital activities. Introduced online forms for booking key services including event support and training. Used Google Analytics to significantly enhance user journey across the IT department internal website, reducing clicks and increasing average time on page. 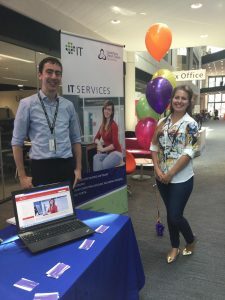 Established the IT department blog – the first internal blog used by a professional service department at CCCU, currently ranks #3 in the University blog platform behind two very prominent public-facing blogs. Migrated under-performing @CCCU_IT Twitter account to @CCCUstudents in order to integrate with central marketing objectives. Created comms plan to smooth over transition, with a staged phase out. Initiated project to refresh all IT department print marketing materials including pop-up banners and business cards. Created desk-top notifications for various projects including Office 2016 and the new student software image 2016. During my time working for the IT department, I also achieved Microsoft Specialist certifications in Word, Excel, PowerPoint, Outlook and OneNote; also attaining Specialist Expert certifications in Word and Excel (both 2013 and 2016). I was the first person at the University to attain Specialist Expert Master certification in Microsoft Office.